Specialist food communications agency, Pelican Communications, say businesses in the food industry are still leaving themselves exposed to huge risk when it comes to social media. 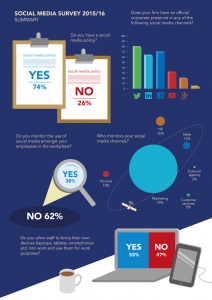 That’s according to the 2015/16 Social Media at Work Survey carried out by the specialist food sector marketing and PR agency and specialist food lawyers Roythornes. Now in its fifth year, the survey – which polls a wide range of businesses in the food sector – asks about policies and practices in relation to social media use in the workplace. This year’s results show that, despite around 80% of businesses having some form of online presence, a staggering 26% have no policy in place on how social media should be used, leaving them wide open to reputation management issues. In addition, despite the percentage of companies allowing employees to use their own personal devices to carry out work-related social media activity increasing from 30% in 2012 to 53% this year, only 38% have a policy in place to govern employees doing so. Michael Bennett, Managing Director of Pelican Communications, said: “Food is an integral part of people’s daily social media activity and companies are using it more and more proactively to promote their brands. “However, while we see wonderfully creative campaigns being created, the survey shows that many companies remain unprotected when it comes to policies and procedures. “As social media becomes increasingly commercial and companies begin to use it as the central core of their promotional strategy, ensuring policies and procedures are in place is vital. Maz Dannourah, associate at Roythornes, which specialises in food and beverage law, added: “It’s great to see the large increase in the of businesses monitoring their online presence over the last four years; 90% of respondents now keep an eye on what is being said about them online compared to just 66% in 2012. “However there is always room for improvement and I can’t stress strongly enough the importance of having quality policies and procedures. As well as studying policies and procedures, the survey also looks at the food industry’s preferred social media channels. Around 80% of companies now have a presence on Twitter while Facebook and LinkedIn are also extremely popular. However, surprisingly few respondents said they used Instagram, despite its huge popularity with consumers. Michael added: “Instagram has an excellent brand engagement rate and is absolutely packed full of food pictures – a huge opportunity for the sector. “The survey shows that, while some brands are using it brilliantly, many companies could still benefit from having a creative presence there.